Need some fat-loss guidance? These three fitness pros reveal what they do to stay lean. Their moderator? None other than our very own Ripped Dude. The Ripped Dude has done it again! With you and your get-shredded goals in mind, Obi has brought together three more awesome athletes to give you their two cents on how to be lean. Be forewarned, however. Some of this information isn't conventional—you may not want to implement it into your program. You might, however, be interested to know the myriad ways diet and training can be manipulated to sculpt the body you want. Read on to learn more! 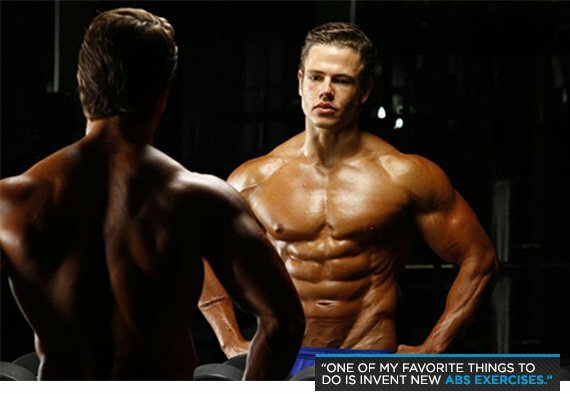 This Aussie fitness personality is a top-three Asia-Pacific model. Not only is he a professional in the fitness field, he's also a successful recruiter at Salesforce.com. Unsalted almonds: The more good fats I get from nuts, the easier I can maintain leanness. 2% cottage cheese: I don't like to cut dairy, but I'm lactose intolerant. Using "lighter" dairy products help me get the protein I need. Green apples: Make a noticeable difference in my body composition and are a great source of natural sugar when I want something cold and sweet. Basmati Rice: Until recently, this was the primary carbohydrate in my meals. MuscleGel Shots: Because my body does not respond well to things like chicken, turkey, and beef anymore, these are my predominate source of protein. How many calories do you typically consume per day to stay lean? 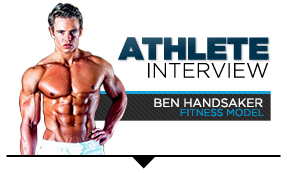 Ben: I train twice per day, so I stay in the range of 3,000 to 3,300 calories. Sonny: That depends on my goals. For maintenance, I eat about 2,600 calories per day. If I want to increase size, anything more than 3,000 calories works well for me. Rosie: I do not use any specific "diet." Instead, I listen to my body and make adjustments to my training and nutrition. My macronutrient ratio and calorie intake may change on a day-to-day basis. Usually, my maintenance calorie intake is around 4,300 each day. However, the amount of calories is much less important than when I have them. I have been using the Lean Gains 16-hour fast with 8-hour eating window since April, 2011. I've noticed that I can eat the same amount of calories in an eight-hour window as I can with 4-6 meals and have better results. How often do you train your abs and why? Ben: I train abs like every other muscle group! You wouldn't spend 20 minutes on arms after a leg session, would you? I spend 45-60 minutes on abs 4-5 times per week. I say that one of my favorite things to do in the whole wide world is invent new abs exercises. I recommend hitting them hard at least three times per week in the morning on an empty stomach. Use a variety of training methods so it's never easy. Sonny Brown is a published fitness model, a personal trainer, a Syn-Tec Nutraceuticals athlete, and the owner of Greater Health. Sonny: I love training abs! I find it beneficial to train them on an empty stomach because I can get a great squeeze and exhale at the bottom or top of every exercise. If I am dialing in for a photo-shoot or competition, I hit them for the two weeks leading up to the event. Otherwise, I usually train them four days per week. Rosie: I train abs twice per week for 100-120 reps each time. I like to do hanging and weighted abs, and increase the volume if I want to see more "grooves." It's important to remember that abs are like any other muscle group—they need time to recover. Seeing your abs is about being lean though, not about doing endless reps.
What type of supplements do you take that helps you maintain your physique? Ben: YOR health products! I use these products because they're designed to un-clog the digestive system so you can absorb more nutrients. When I'm dieting for a competition, I need to make the food I eat go a long way. These products are also designed to "alkalinize" your body, which helps me feel more energized. Sonny: As a natural athlete, supplementation is important. I find that using quality protein powder for peri-workout nutrition is essential. Apart from protein powder, I use a combination of BCAAs, Beta-Alanine, Arginine and CLA Capsules. When I'm carb-cycling, I feel these supplements help me keep a round, full, and vascular look. This New Zealander is a national track and road-cycling champion. She's an exercise physiologist, professional trainer, writer, and model. Rosie: Because protein powders upset my stomach, I use RecoverPro and MuscleGel shots for my primary protein sources. I also use fat burners to help maintain leanness. 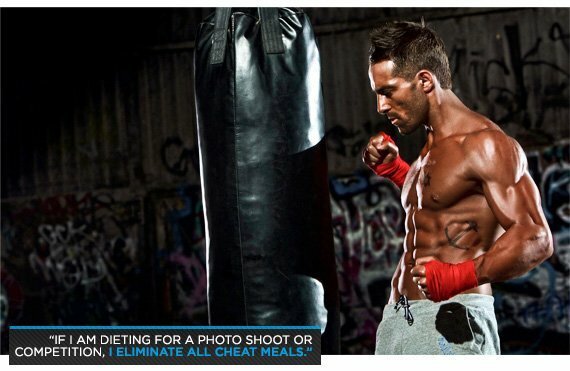 Do you eat cheat meals? If you do, what do you eat? Ben: I actually don't call them cheat meals! I call them "victory meals" because they should be a celebration of your commitment and dedication to the diet. My "victory meal" frequency depends on my physique and conditioning, so it varies. If I'm preparing for a competition, photo shoot, or starting a new diet, I'll wait two weeks before enjoying a victory meal. Typically, I have a victory meal once per week on a Sunday when I take my girlfriend out for dinner. If we eat in, I like to have a pizza or Ben and Jerry's ice cream. Sonny: Recently, I've been eating more calories after I train muscle groups I want to grow. But, if I'm dieting for a shoot or competition, I eliminate all cheat meals. If I'm not dieting, and can keep my body-fat levels low, then I allow myself some Japanese or Baskin Robbin's ice cream after a tough training session. Rosie: For me, almost every day is a cheat meal. I generally just eat what I want when I want. I admit, this is an unconventional approach—but it works for my body. I am, however, working on making my nutrition a little cleaner so it's more health-oriented. I know many people would not agree with the way I do things, but I'm not a dieter and never have been. One's diet should be a lifestyle, not a temporary plan. Nutrition has always been the one area where I have not had much discipline. My diet is honestly what most people would call a perpetual cheat. Although it may not work for everyone, my diet is a specific adaption for me.